In Berlin and Brandenburg, there are a large number of memorials for the victims of the National Socialist dictatorship, alongside the memorial sites, documentation centres and historical museums. A few of them are briefly described below. 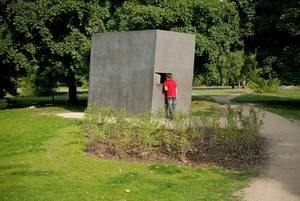 The Memorial to Homosexuals Persecuted under National Socialism was built following the design of the Danish-Norwegian artistic duo Michael Elmgreen and Ingar Dragset. 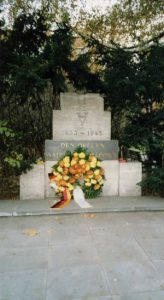 The initiative for this memorial was made by the Lesbian and Gay Federation in Germany (Lesben- und Schwulenverband in Deutschland, LSVD) and the initiative „to commemorate the homosexual victims of National Socialism“. The National Socialists had already mandated the comprehensive criminalisation of male homosexuality as early as 1935. In addition, the intended provisions against homosexual conduct contained in paragraph 175 of the penal code were significantly intensified and expanded. Even a casual kiss hello between two men could lead to prosecution. Paragraph 175 meant prison or a hard labour penitentiary. There were over 50,000 convictions. In some cases, NS authorities could force the convicts to be castrated. Several thousands of gay men were deported to concentration camps because of their homosexuality. A large portion of them did not survive the camps. The Memorial to Homosexuals Persecuted under National Socialism was built in 2003, following a resolution passed by the German Parliament. It is meant to honour the victims who were persecuted and murdered and to keep the memory of this injustice alive, while at the same time being a constant symbol against intolerance, hostility and the marginalisation of lesbians and gays. The memorial’s maintenance is financed by the Federal Office for Culture and Media’s budget. The Bundesland of Berlin provided the site. The Memorial to the Murdered Jews of Europe Foundation is responsible for supervising the maintenance of the memorial site. www.berlin.lsvd.de – Lesben- und Schwulenverband in Deutschland (LSVD), Landesverband Berlin-Brandenburg e.V. The memorial site is accessible at all times. Not far from this site, hundreds of members of the Sinti people suffered in a camp from May 1936 on until our people were liberated by the glorious Soviet Army/Honour to the victims. The last two words are in Romanes and can be translated as „Stay with God“. This slab was built in 1990 based on the initiative of the Cinti Union together with Reimar Gilsenbach. and Roma were forced to live there. People were randomly deported and arrested. Men and women, old people and children. The memorial site is accessible to everyone at all times. „Sunken in face / extinguished eyes / cold lips / silence / a torn heart / without breath / without words / no tears.“ In addition, several boards provide information on the exclusion and mass murder of this minority throughout Europe during the national socialist reign of terror. 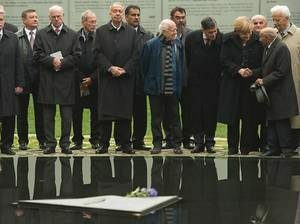 The memorial is located in Tiergarten, south of Scheidemannstraße, across from the Reichstag building. It will be open to the public after its completion. This was the first memorial erected in West Berlin for the victims of National Socialism. 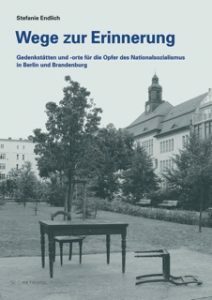 From April 1940, the headquarters of the operation that initiated, coordinated and carried out the mass murder of patients from clinics and care homes in the Third Reich were located in Tiergartenstraße 4 in Berlin. The operation was codenamed „T 4“ or simply „Aktion“ („Operation“). Over 70,000 people died as a result of this operation before it was halted on 24 August 1941 following public protests. The murders began with the outbreak of war in September 1939 and continued throughout the German Reich and in many occupied territories, especially in Eastern Europe, both after the „euthanasia stop“ in August 1941 and after the invasion of the Soviet Union in June 1941. The classification, „selection“ and murder of these patients made this the first centrally organised and systematic process of mass murder carried out by the Nazis. „T 4“ was however only one aspect of the violent crimes carried out against patients from clinics and care homes. Researchers estimate that a total of 300,000 people died as a result of the so-called euthanasia programme in Europe. However, there are still no reliable figures, especially for Eastern Europe. In November 2011, the German Bundestag voted to establish a »Memorial to the Victims of National Socialist ›Euthanasia‹ Killings« on the historic grounds of the administrative headquarters of the T4 programme. The state of Berlin subsequently launched a competition to design the memorial. The winning entry by the architect Ursula Wilms and the landscape architects Nikolaus Koliusis and Heinz W. Hallmann consists of a 24-metre-long wall made of clear light blue glass and set into a dark grey concrete surface that gently slopes towards the centre. An outdoor exhibition provides information about the history of the ›euthanasia‹ killings and their legacy up to the present-day. The Memorial was opened to the public on 2nd September 2014. The memorial is accessible 24 hours a day. 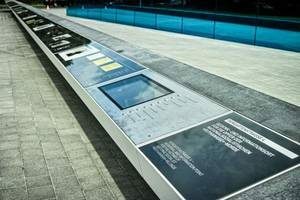 The Memorial and Information Point for the Victims of National Socialist „Euthanasia“ Killings and the open air exhibition are accessible without barriers. The Grunewald S-Bahn station is located on the western outskirts of Berlin. Between autumn 1941 and most probably spring 1942, deportation trains carrying Berlin Jews to ghettos and extermination camps in the east departed from this train station. The creation of the memorial was initiated by the Deutsche Bahn, the German national railway company, to commemorate the deportations undertaken by its predecessor, the Deutsche Reichsbahn. On October 18, 1941, the Reich Main Security Office began deporting Jews from Berlin, in cooperation with the Reich Ministry of Transport. That day, a special train of the Deutsche Reichsbahn left the Grunewald train station carrying about 1,000 Berlin Jews. This first transport was headed for the Łódź Ghetto. The police and SS had assembled the people for this transport in a collection camp for Jews, which was located in the synagogue in Levetzowstraße in Berlin’s Moabit district. They then chased most of the men, women and children to Grunewald by foot. Until March 1945, about 180 further transports from Berlin to the ghettos followed; from August 1942, transports were also directly headed for extermination camps. From 1942 on, deportation trains also left from the Anhalter train station and the freight terminal Moabit. The deportations were planned by the Reich Main Security Office and conducted by local security police. The National Socialist authorities relied on cooperation with the Reichsbahn in order to carry out the deportations. At first, the special trains consisted of passenger cars, yet from 1942 on, the Reichsbahn increasingly began using cattle cars for the deportations. The »conveyance« of the Jews was billed to the Jewish community: 4 pfennigs were charged per kilometre for adults and 2 pfennigs for children above the age of four. Over 50,000 Jews perished following their deportation from Berlin. Many of the transports were destined for the ghettos in Theresienstadt, Minsk, Riga, Kaunas and Łódź. From July 1942 on, several transports of Berlin Jews went directly to Auschwitz-Birkenau and other death camps. About 500 Jews from cities and communities in the vicinity of the capital were also deported from Berlin. This list will be expanded.